Keratoconus (from the Greek for conical cornea) is a degenerative condition of the cornea where the cornea thins and bulges forward. This distortion results in short-sightedness and astigmatism, and may progress to scarring of the cornea. As the cornea steepens and thins, the patient experiences a decrease in vision which can be mild or severe depending on the amount of corneal tissue affected. The condition is extremely variable, with many people simply wearing glasses and possibly not knowing they have it. Others require contact lenses to achieve good vision and a small proportion (around one in ten) eventually need corneal transplanatation. Keratoconus has no known cure. It is a progressive disorder that may progress rapidly or sometimes take years to develop. Keratoconus usually begins during the teenage years (mean age of onset is age 16 years), but has been reported as young as 6 years. 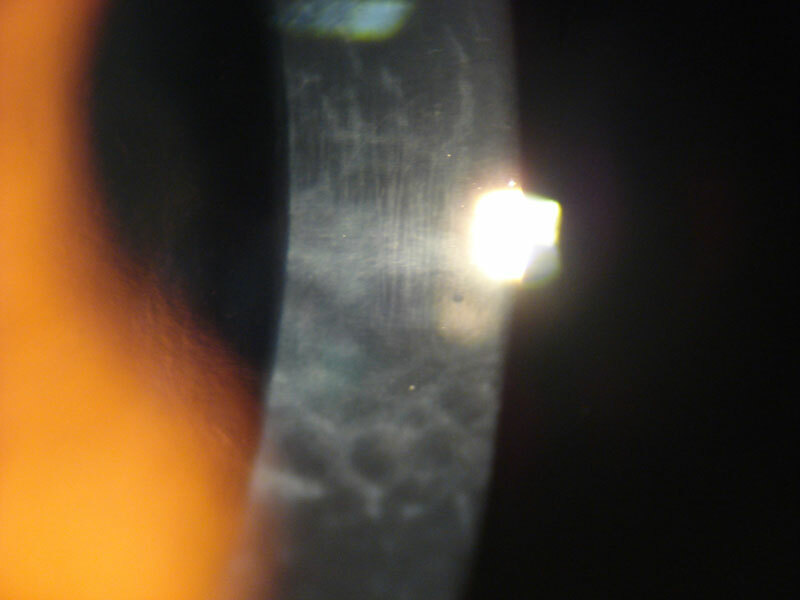 Keratoconus rarely develops after age 30 years, but diagnosis is often delayed in milder cases. It usually affects both eyes, but is often asymmetric. The disease process is active for about 10 to 15 years, then it may be stable for many years. During the active stage, change may be rapid. Keratoconus appears to result from a number of different causes, and may in fact be a common outcome of more than one diseases. 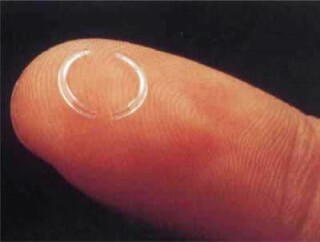 Mechanical factors such as excessive eye rubbing or long-term use of non-gas permeable contact lenses and genetic factors have been implicated. Around 6-8% of patients have a family history of keratoconus, with an approximately 10% risk of the children of someone with keratoconus being affected. 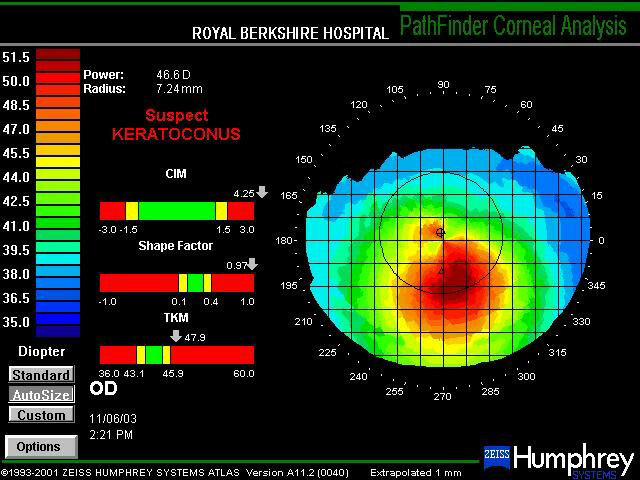 The diagnosis of keratoconus is made by a combination of clinical examination, refraction (the glasses test) and corneal topography. 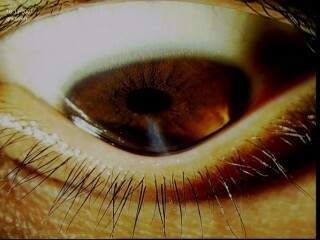 The corneal topography maps the shape of the cornea, demonstrating areas of distortion. In mild cases the corneal topographer may diagnose the condition when there are no other signs. A diagnosis of keratoconus means that you must not undergo laser refractive correction of short-sightedness: LASIK, LASEK or PTK, as it is likely to cause the keratoconus to progress rapidly. 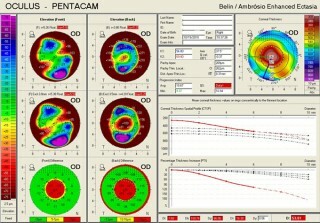 This videokeratoscope topographic analysis shows high irregular astigmatism, maximal below the visual axis. This results in very poor vision, correctable only by contact lens wear or corneal surgery (corneal inlays or corneal grafting/keratoplasty). Typically, vision loss can be corrected early by spectacles; later, irregular astigmatism requires optical correction with rigid contact lenses. Contact lenses provide a uniform refracting surface and therefore improve vision. 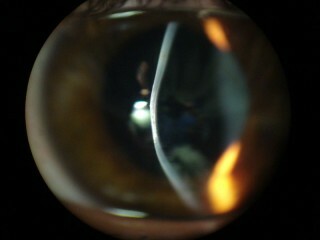 Keratoconus requires specialist contact lens fitting by a contact lens practitioner with expertise in the field. Corneal Collagen Cross-linking with Riboflavin (also known as C3R) is a non-invasive treatment for keratoconus involving the use of ultraviolet light to strengthen the weak corneal structure in keratoconus. 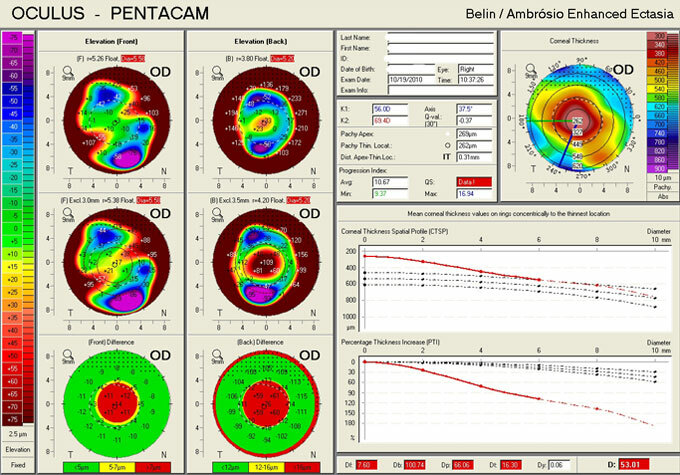 Clinical experience with the procedure goes back to 1998, with 6 year follow-up data indicating long-term efficacy in stabilising keratoconic corneas, preventing further progression, and in some cases improving corneal shape. Please see separate information page corneal collagen cross-linking. 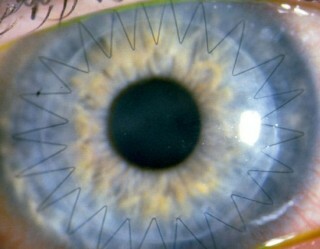 Intrastromal inlays (INTACS and Kerarings) are a recently developed technique for modifying the shape of the keratoconic cornea. Their use was approved by the National Institute for Health and Clinical Excellence (NICE) in 2007. Paired transparent acrylic implants are inserted into the cornea to strengthen it and correct its shape. The aim is to reduce short-sightedness and astigmatism. They may be a suitable treatment for eyes in which the cornea has deteriorated to such an extent that contact lenses no longer work well, or are uncomfortable. 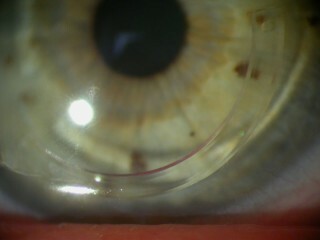 In these cases the inlays may prevent or delay the need for corneal transplantation. The role of intrastromal rings has not yet been fully established however, as eyes with mild keratoconus may see better with contact lenses, whilst more severe cases may achieve better vision following corneal transplantation. Keratoconus is one of the most common reasons for a corneal transplant operation in the UK, however most people (90%) with keratoconus will never need an operation. I offer two procedures for keratoconus, deep lamellar or penetrating keratoplasty. Which is most suitable for you depends on the condition of the eyes, and I will discuss the options with you fully should surgery become necessary.